Cadbury has taken its Lunch Bar Dream bar to the max, with the launch of a limited-edition Lunch Bar Dream MAX - adding yet another exciting addition to the Lunch Bar range and even more dreamy indulgence for chocolate fans. Lunch Bar Dream MAX is a delicious chocolate bar covered in a white confectionary coating, loaded with delicious wafer, caramel, peanuts and crisped rice. With such delicious ingredients, Lunch Bar is designed to give you much, much more. Oviaas! To enter, simply purchase any two (62g) Cadbury Lunch Bars, Dial*120*777888#, follow the prompts, enter the last four digits on each chocolate wrapper, and wait to see if you are a winner! 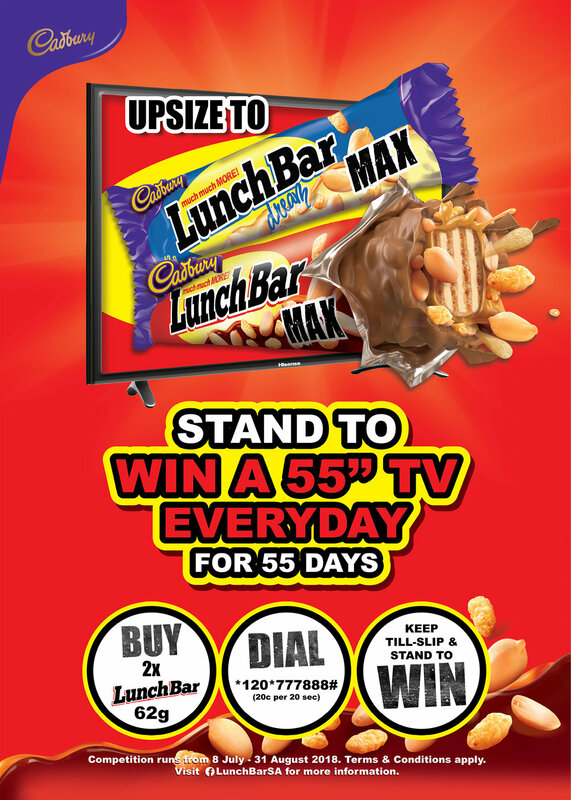 Grab your Lunch Bar Dream MAX 62g bars now from selected retail outlets nationwide or visit www.cadbury.co.za for more information. Also, follow @LunchBarSA on Facebook or @CadburyChocBar on Twitter for #muchmuchmore ways to MAX out with Cadbury Lunch Bar. Terms and conditions apply.